Saint Johns FC represented our church and Accrington with pride and put in a performance which underlined what a determined and talented group of players the team has to offer. Manager Paul POUNTAIN was spoiled for choice in the run up to the final, played at the superb venue of The Brian Addison Stadium, home of Squires Gate FC, as all fifteen players who played in the semi-final were once again available for the final. POUNTAIN once again opted for the familiar 4-2-3-1 formation which has proved to give the team a good balance this season. The starting team was the same team for the third consecutive game with Tom HALLIWELL starting in goal with the ever dependable full backs of Paul HAWORTH at right back and James MULHALL at left back. Gary BARON, who has served the team so well since the team was formed in 2014, informed POUNTAIN that this was to be his final game which will be a big loss, and he partnered Ryan LAWSON at centre back. Captain Craig RICHARDSON and Liam REYNOLDS played in the holding midfield role and their performance was sure to be crucial in this game. The attacking three of Jake SCHOFIELD (right), Eddy RILEY (left) and Rob ADDISON (centre) would look to support POUNTAIN at every given opportunity as he led the line up front. There was the attacking threat of Michael MENSAH, Dave SHAW and Andrew DI FRANCESCO on the substitutes bench and the defensive option of Ryan ROBINSON should POUNTAIN need to shuffle the pack. For some of the players this was the first time that they had ever played in a stadium and the added bonus of playing under the floodlights meant everyone was looking forward to pitting their wits, for the third time this season, against the favourites Wray FC, who were leading the Sportsreach league table by three points and were unbeaten in that all season. Wray FC had a large following of supporters but the team were grateful for the backing of those who made the 45 minute trip along the M55 to back them. St Johns FC were also indebted to Accrington Stanley who provided the team with a full kit for the big occasion. The team were hoping to win the Cup and that this could be a precursor to Stanley holding aloft the League Two trophy in May.After a challenging Gospel presentation by David EARNSHAW about how ‘once you cross the line you can never go back’ regarding the decision about accepting Jesus as our saviour in this life, the players were also keen on making sure that once the whistle went in this game they had no regrets about the decisions they made on the pitch and the commitment they showed in the 90 minutes. POUNTAIN and RICHARDSON both encouraged the players to not be overawed by the occasion and they needn’t have worried.Saint John’s started the game confidently with SCHOFIELD and RILEY causing numerous problems down the wings in the early exchanges. Wray were clearly a good footballing team spear-headed by manager Mark ELLERSHAW in the centre of midfield and the powerful Jake FAWCETT, who has previously appeared for Saint John’s back in 2015 in the All Day Tournament, up front. RICHARDSON and REYNOLDS were winning the early exchanges in midfield which meant Rob ADDISON was free to concentrate on attacking the back line of Wray, alongside POUNTAIN, and their dominance was to pay off as early as the fifteenth minute. Rob ADDISON received the ball from a SCHOFIELD pass in the area, turned the centre back brilliantly before slotting the ball into the bottom corner. GOAL! 1-0! The relief was palpable and with Saint John’s now enjoying a confident spell of possession the crowd did not have to wait long for another goal and what a goal! Jake SCHOFIELD, who had already surely won goal of the tournament with his rocket versus Loko in the quarter-final, received the ball out on the right wing, took on three defenders before curling the ball into the top corner from outside the area! Brilliant! 2-0! Saint Johns FC continued to attack knowing the next goal could be crucial. Wray, struggling to cope at this point with the attacking four of Saint Johns continually were guilty of fouling Saint Johns’ flair players. RILEY was caught late leading to a yellow card for their right back, who was subsequently substituted. However after all this positive attacking play, FAWCETT who was a threat all night, did manage to reduce the deficit with a great run and finish to the bottom corner on 30 minutes. 2-1! Saint John’s though, being encouraged by the faithful fans, continued to press the Wray backline and found a way through once again when POUNTAIN wriggled free down the left and put a hopeful ball into the box which SCHOFIELD managed to get to and shot powerfully at goal only for a deflection off a Wray defender which made it impossible for Wray keeper HUTCHINSON to get to and made the score 3-1! SCHOFIELD’s ninth goal in seven appearances this season.At half-time Saint John’s knew that Wray FC would come at them in the second half. Rob ADDISON was also struggling to breath after he was battling through the first half with a chest infection. Not wanting to make any changes too early POUNTAIN stuck loyally with the same eleven. From the outset Wray came out with the intention of attacking Saint Johns to try and get an early goal to drag themselves back into the game. ELLERSHAW would have been pleased with the early pressure in the second half. On 55 minutes DI FRANCESCO replaced ADDISON whose performance was nothing short of incredible especially in light of his ill health. Wray scored a second on 60 minutes when the impressive George WHITAKER got the ball down the left wing and fired a cross come shot into the top corner. 3-2! With Saint Johns FC now facing a barrage of attacks from Wray they suffered two further blows when POUNTAIN and BARON, both 35 years old and both suffering from cramp, had to be replaced. POUNTAIN rather than bolster the defence with a defensive substitution brought both strikers MENSAH and SHAW onto the pitch to try and hold up the play in Wrays half. Whilst Wray, now playing some good, attacking football, kept pushing the defensive line-up of HAWORTH, LAWSON, SCHOFIELD who was now winning everything in the air and on the ground at centre-back, and MULHALL these lads were repelling everything that Wray were throwing at them. REYNOLDS and RICHARDSON were now camped in the defensive third and battling brilliantly. Time after time the team put their bodies on the line and defended with everything they had. For all Wray’s possession though they were not allowed many shots on target. ELLERSHAW did see a long range effort hit the bar on 80 minutes. The atmosphere within the ground was electric. POUNTAIN, no longer able to influence the game on the pitch was increasingly proud of his players’ determination to win this terrific competition. SHAW and MENSAH both held the ball up well and won the headers when needed. It was a brilliant effort by the whole squad and when the final whistle blew the team were delighted to be able to hold aloft the Sportsreach Champions Cup. Wray were as tough as POUNTAIN expected them to be but ultimately the performance both as an attacking threat, particularly in the first half where the team deserved their lead, and then the defensive brilliance of the backline in the second half meant the victory will live long in the memory of this talented set of players. Liam REYNOLDS, who has been incredible this season won Player of the Final and when RICHARDSON lifted the Champions Cup there was a great feeling of pride amongst all the players. Commiserations to Wray FC who will now look to win the league. Thanks must go to Sportsreach for organising such a fantastic competition and Sooty for refereeing the game so well. Also thanks go to Squires Gate FC for hosting the final and allowing the use of their facilities and most notably a great pitch, and also to the fans of both teams for making the long trip. Dave Finch also drove the team to and from the stadium in the minibus so that was greatly appreciated. Let’s hope this is the first of many trophies that are lifted by the team in the coming seasons! Also a special mention to Gary BARON who retires from competitive football on a high after lifting the cup.Saint Johns FC: HALLIWELL; HAWORTH, MULHALL, LAWSON, BARON; REYNOLDS, RICHARDSON(c); SCHOFIELD, ADDISON, RILEY; POUNTAIN. Subs: MENSAH, SHAW, DI FRANCESCO AND ROBINSON. 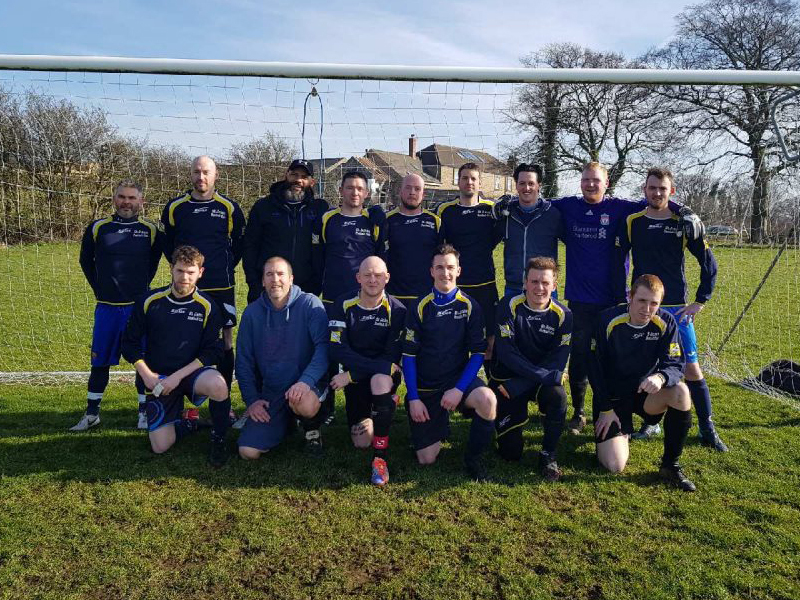 After three seasons of competing in the Sportsreach Champions Cup Saint Johns FC, managed by Paul Pountain and captained by Craig Richardson, have reached the final. In their first season they lost in the first round to Lancaster and then in the second season they lost to Lancaster again, this time in the semi-final. 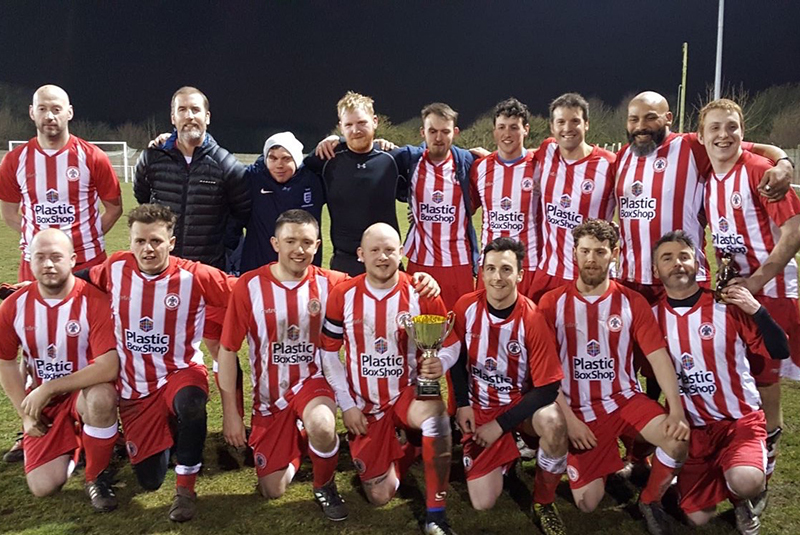 But this season Pountain’s team have come back more determined than ever to reach the showpiece event at the end of the season and now look to win their first silverware in an 11-a-side competition. It has been a gruelling schedule of games and the below is a review of the results that have got Saint John’s through to the final at the Brian Addison Stadium, Squires Gate on Thursday 15th March 2018.Round One – first leg – Wray (a), Saturday 11th November 2017, Burton-in Lonsdale (Lost 1-4) Saint John’s FC started with a tricky looking tie against the league leaders in the Sportsreach League who were unbeaten so far. This will obviously also be their opponents in the final but this was not known at this time. Pountain had a weakened squad as there were a number of key players unavailable for this first leg. Left back Ryan Robinson had managed to round up four new faces for the team to ensure we had enough players for the game. Tom Donaghey, our vicar, started the game and gave a good account of himself at right back. The first half ended 0-3, with two goals from George Whittaker and one from Martin Huddleston giving Saint Johns a mountain to climb. There was also an injury to Ben Whitaker which had weakened the defensive lineup. In the second half Saint Johns, to their credit, took the game to their opponents and Micky Mensah grabbed the team a goal back after he stabbed home a shot in the area to give the team hope in the 65 minute. Whilst pushing for a second goal though, unfortunately Wray FC scored a breakaway goal through William Preece which left the game at 1-4 leading into the second leg.Teams: Saint Johns: Halliwell; Donaghey, Whitaker, Lawson; Robinson; Din, Reynolds, Richardson(c), Addison, Mensah, Pountain. Subs: Schofield, Bassett, Ollerenshaw, Barnes (all used). Wray: Hutchinson; Gorst, Wallbank, Dawson, Preece; Whittaker, Ellershaw(c), Harrison, Atkinson, Talbot; Huddleston. Subs: Woodhouse, Lawson, France (all used).Round One – second leg – Wray (h), Saturday 16th December 2018, Hyndburn 3G (Won 4-2) 5-6 agg Pountain had a stronger squad to choose from in this second leg and the team knew they would have to start well in order to try and get back into the tie. Saint Johns FC started at a blistering pace and had a number of chances before Pountain managed to score 2 goals in the space of 3 minutes, the first arriving on 35 minutes and the second on 38 minutes. Both were scrappy close range finishes but were welcome nonetheless. 2-0 at half time; 3-4 on aggregate. Unfortunately Graham Emerson scored for Wray early in the second half to make it 2-1. Saint Johns continued to press forward though and Liam Reynolds brought them back in the game with a terrific long range shot from the edge of the box which gave the keeper no chance. Saint Johns FC went searching for the fourth which would take the game to extra time but George Ibbotson scored to take the tie to 3-2 and finish any chance of a win. Pountain completed his hatrick with seconds to go, when put through one-on-one with the keeper however Wray won the tie 6-5 overall. The good news was though that Saint Johns FC had done enough to reach the quarter final as they had finished as the second best loser so fortunately moved into the quarter final.Teams: Saint Johns: Halliwell, Mulhall, Baron, Lawson Robinson; Schofield, Richardson(c), Reynolds, Di Francesco; Shaw, Pountain. Subs: Mensah, Simmonds (both used), Donaghey. Wray: Hutchinson; Park, Taplin, Stewart, Preece; Swinbank, Harrison, Ellershaw(c), Atkinson, Emerson; Ibbetson. Sub: Briggs (used).Quarter Final – first leg – Loko (a), Saturday 13th January 2018, Carnforth High School (Won 6-3) Saint Johns FC went into this with a near full strength squad and had a strong belief that they could get a positive result to take back to Hyndburn. An early goal on 8 minutes from Craig Richardson after great movement between the front four of Addison, Riley, Pountain and Mensah meant that the game started well. Unfortunately Loko equalised on 36 minutes when a well struck direct free-kick levelled the scores up. Jake Schofield restored the lead though with an incredible long-range strike which hit the bar and bounced down over the line. An absolute cracker! 2-1 at half-time. The second half couldn’t have started any better as Richardson continued his purple patch in front of goal with two further strikes to complete his hatrick, one from the penalty spot after Dave Shaw had been brought down. Schofield and Pountain also added second half goals and though Loko did pull two goals back to make it 6-3 at full-time, it was a job well done going into the second leg. The only downside was a nasty looking eye injury for Mulhall for a challenge which should have been a straight red but the opposition player avoided even a booking.Team: Halliwell; Haworth, Baron, Lawson, Mulhall; Richardson(c), Reynolds; Riley, Addison, Pountain; Mensah. Subs: Schofield, Robinson, Shaw, Carrick (all used).Quarter Final – second leg – Loko (h), Saturday 27th January 2018, Hyndburn 3G (Won 2-1) 8-4 agg Pountain again had good strength in depth for this home game though was missing the influential Ryan Lawson for the first time at centre back. This meant Richardson partnered Gary Baron at the back. Ryan Robinson came into the team for the unavailable Mulhall after a superb performance from the bench in the previous game. Whilst Saint John’s, who had won 3 out of 3 at home in this competition, started well and carved open a few opportunities early in the game, most noticeably when Mensah hit the post, it was Loko who looked like they had found a way back into the tie. Player manager Andy Towers scored on the 17th minute with an easy header when left unmarked in the box. Half-time and 6-4 up but there were still 45 minutes to make sure the team progressed. Fortunately it was Saint Johns who scored the next goal when Pountain crossed the ball from the right and found substitute Eddie Riley, who is proving to be an impressive new addition, who finished well on 53 minutes. The tie was finished once Jake Schofield scored a great free-kick on 81 minutes to ensure progression to their second successive semi-final. With Great Eccleston and Lancaster both being eliminated at this stage all in the camp were hoping for a favourable draw in the semi-final.Team: Halliwell, Haworth, Baron, Richardson(c), Robinson; Schofield, Reynolds; Brendon, Addison, Pountain; Mensah. Subs: Riley, Stinchon (all used).Semi-final – first leg – Quernmore (h), Saturday 10th February 2018, Hyndburn 3G (Won 9-3) The first leg of the semi-final could not really have gone much better for Saint Johns. Sticking with the 4-2-3-1 formation which had served them so well in the quarter-final the team caused Quernmore all sorts of problems. The team were clearly highly motivated and determined not to capitulate like they did in last season’s semi-final. Goals from Pountain (4 and 40 mins), Jake Schofield (31 mins) and Rob Addison (35 mins) meant that the team had a commanding 4-1 lead at half-time. This was further added to in the second half by the uncontainable Schofield who scored a second half hatrick, a great free-kick was scored by Richardson and a header from Pountain completed a ‘perfect hatrick – left foot, right foot and header’ and meant that Saint Johns held a six goal lead – 9-3 going into the second leg.Team: Halliwell, Haworth, Baron, Lawson, Mulhall; Richardson(c), Reynolds; Riley, Addison, Schofield; Pountain. Subs: Mensah, Robinson, Whitaker (all used).Semi-final – second leg – Quernmore (a), Saturday 24th February 2018, Scorton (Drew 1-1) 10-4 agg Pountain was able to select the same starting lineup in the second leg of the semi-final and whilst it was a much closer game this time, they saw the game through professionally. There was a slight scare when Quernmore went 1-0 up with their first attack but all nerves were calmed when Eddie Riley scored a magnificent equaliser. Controlling the the ball down the left wing after a good pass from Paul Haworth he chipped the ball up and over two defenders before lashing the ball into the net past the despairing keeper on the 32nd minute. The team were indebted to a couple of good stops by Halliwell in the second half but could also have won the game when the fearsome front two of Micky Mensah and Dave Shaw combined with the latter put the ball just wide of the far post.Team: Halliwell, Haworth, Baron, Lawson, Mulhall; Richardson(c), Reynolds; Riley, Addison, Schofield; Pountain. Subs: Mensah, Robinson, Di Francesco, Shaw (all used).So Saint Johns FC march into the final on Thursday 15th March. The game will kick-off at 7.45pm at the Brian Addison Stadium, FY45DS. Please come and support the team who have put in a lot of effort over the past four months to get to the final. There will be refreshments available at the stadium. The team looks forward to your support. It would be great for the support to outnumber Wray’s support and really give the lads the backing of Saint John’s Church.